The award-winning* Windsor On Ice is back for it’s 7th year at Alexandra Gardens, Windsor, in just one month from today! This magical event is supported every year by ABC Marquees, our professional team of marquee technicians and our own ice rink hire supplier, Cites On Ice. Open EVERY DAY from 26th November until 2nd January 2017 (except Christmas Day), with indoor and outdoor ice rinks and many more attractions, this year’s Windsor On Ice promises fantastic festive fun at an affordable price. 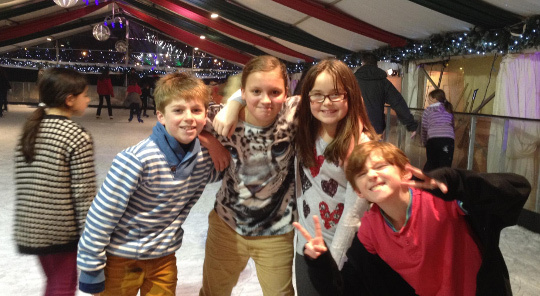 The Christmas ice rink is suitable for all ages and levels of skater, providing a great value day out for all the family or the perfect venue for your Christmas party. There are several ticket options available including Family Tickets and group discounts plus special offers and Ticket Giveaways via the official Windsor On Ice website and Facebook page. Party packages are available, tailored to suit you, with a function room to hire plus 45 minute ice skating session, with many great savings for schools and clubs. For a limited time only, you can buy Early Bird BOGOF tickets valid for single tickets (2 for the price of 1) on certain dates in December! * Windsor On Ice was voted a ‘Top 100 UK Business’ by TheBestOf Windsor in 2016, with an impressive rating of 5 out of 5 stars based on over 100 reviews. Marquee hire supplied by ABC Marquees and both ice rinks – made of REAL ice! – supplied by Cities On Ice.